It's happened to everyone at one point or another. You're playing your favorite FPS and minding your own business when your character finally succumbs to that pesky stream of bullets that's been bouncing off his face for the past two minutes. "Aw man," you say aloud while a big, ominous Game Over screen stares you down. "Well, at least I can jump right back in and..." But you can't. Suddenly, you're 30 minutes away from where you kicked the bucket – your previous progress rotting at the bottom of some virtual wastebasket. "Well, at least I can vary up my tactics and see the game from a different angle this time." Nope. So many invisible walls that you may as well be a mime. "Well, at least I can—" Nuh-uh. Can't do that either. So you pause to take a breather, but they immediately start suffocating you. Games For Windows logos. Everywhere. And then you wake up drenched in a cold sweat, safe in your own bed and free of the nightmare's cruel clutches. "It was just a dream, " you mumble before dozing off again. Or was it? PC gaming is far from dying, but not for a lack of effort on consoles' parts. While consoles have doubtless aided in bringing videogames to the masses, they've also slowly but surely molded gaming in their own image. The end result? Well, stories like the one above, for starters. But that's only the tip of the iceberg. Jump past the break for consoles' most egregious crimes against our hobby. Let us begin our tour with Unfortunate Console Consequences 101: the bad port. It can take many forms, and even in this day and age of developers working tirelessly for platform equality, it's all-too-common. From Resident Evil 4 to Grand Theft Auto IV to a large number of games without fours in their titles, fun-killing, sometimes game-halting bugs have plagued many major PC releases. Frankly, it's inexcusable. Let's not, however, forget the other side of the coin: the inexplicably delayed port. 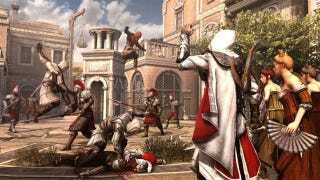 Ubisoft's Assassin's Creed series, for instance, has been doing it for years – with speculative whispers chalking it up to piracy avoidance. But here's the thing: it only encourages piracy. If you treat people like second-class citizens, don't be surprised when they start doing whatever's necessary to get ahead. To be completely honest, we hate the phrase "dumbed-down." It's often carelessly hurled at any game that's made a significant change – whether for better or worse. Mass Effect 2, for instance, was sensibly streamlined. Crysis 2 looks to be taking a similar route. Sometimes, though, the term's ugly fingerprints are so thoroughly caked all over a game that it's unmistakably the culprit. For instance, the original Dragon Age was a clear descendant of old-school PC RPGs like Baldur's Gate – multilayered complexities included. Its sequel, by contrast, is a messy mish-mash of console-friendly simplicity, cut-and-paste level design, and tiny glimmers of the original's brilliance. Oftentimes, the issue isn't even so much that developers try to expose console players to popular PC-centric franchises. Rather, it's that they do so haphazardly, resulting in an ugly duckling of a product that doesn't entirely fit on any particular platform. And that's an incredible shame when you look at efforts like CCP's online console FPS Dust 514, which seeks to compliment the uber-complex Eve Online, but not replace it. Sadly, it's definitely the exception – not the rule. Current console tech is at least five years-old – except for the Wii, whose innards' shelf date came and went shortly after shelf dates were invented. In the big-budget gaming sector, that fact is unavoidable. Taking advantage of truly cutting-edge hardware simply isn't economically feasible for developers because most of the crowd is still lagging far behind the frontrunners. Without a doubt, we PC gamers have the shiniest hotrods on the lot – and we've even seen what they can really do thanks to Epic and Crytek's recent tech demos – opportunities to put them to the test are few and far between. As for when console-makers will decide to finally kick-off a new "next-gen," it's tough to say. Kinect and Move are meant to extend their respective platforms' lives by up-to-five-years, but that could very well be pie-in-the-sky marketing speak. Plus, many developers like consistent, well-understood hardware architectures. In other words, no rush. So, for PC gamers, it's definitely a "the sooner, the better situation," but we're far from the only factors in this equation. In the great race to the finish that is meeting that big launch deadline, sometimes developers have to take a step back and realize that they'll scarely have time to pack in "everything" – let alone "and the kitchen sink." And while mods are an integral part of PC gaming, they only make waves in Console Land every once in a blue moon. The end result? "Well, we might release official mod tools sometime in the future," which is the industry equivalent of "You are currently on hold. Your business is important to us. Listen to this looping track of light jazz for the 15th time." "My platform's better than your platform." "Halo's better than Half-Life." "PlayStation? More like...," well, we'll let you fill in the blank on that one. Point is, these highly targeted, marketing-enhanced platform boundaries de-emphasize the most important part of our hobby: the games. So instead of appreciating the combination of blood, sweat, and tears that's been wrung from the past three years of some poor developer's life, we argue over which platform's "the winner." We call each other names. We climb up on our soapboxes to rant about, well, different boxes. But really, why does it even matter? Simple: it doesn't. Believe it or not, this hobby's about having fun – not raining on other people's parades. Let's not lose sight of that fact. Games are fraught with their shares of formidable foes, but few actively seek to harm your experience more than mandatory auto-save. Countless keyboards have been shattered into second-rate Scrabble tiles over checkpoints that are worse than Gandalf about letting you pass. It's sort of an odd trend, too, seeing as "save wherever you want" features have been around for ages and only take one or two clicks/button presses to access. We suppose it's all in pursuit of the holy grail that is effortless, thought-free immersion, but that's generally the furthest thing from our minds when we're un-embedding our mouse from a potentially related mouse-shaped hole in the wall. On that note, while not progress-related, quick-time events make a similarly cringe-worthy bellyflop when attempting to leap from consoles to PC. Controllers: a few possible buttons. Keyboards: six trillion keys. Developers: do the math. Ah yes, the standard-bearer for the "well clearly, if console gamers like it, PC gamers will love having it forced upon them too" movement. Calling Games for Windows a trainwreck wouldn't be doing it justice, because trainwrecks eventually end. We prefer to think of GFW as a trainwreck that collided with a car wreck that collided with a plane wreck that collided with the Large Hadron Collider. At every turn, it's tried to give PC gaming an Xbox Live makeover, and PC gamers have been unsurprisingly outraged. After all, if we wanted an Xbox, we would have bought a friggin' Xbox. Please, though, Microsoft, none of that silly Avatar busine— oh. Oh no. If it hasn't already become glaringly apparent, game developers are only human. They can't be everything for everyone. We wish, however, that they'd stop feeling so pressured to lie about it. Unfortunately, the trend these days seems to go something like this: Formerly PC-Centric Developer X begins to focus on consoles. Longtime PC fans feel slighted and start complaining. Formerly PC-Centric Developer X replies that it'll always be a PC developer first and a console developer second. Then the PC version of its game doesn't get a demo, gets delayed for more than a year, and ends up being an outsourced port. We understand, developers and publishers: you're running a business. But we're not stupid. Give us the truth – even if it hurts. Kinect's only the most recent example in a long line of devices that have been seriously held back by consoles' proprietary nature. Even so, it's incredibly indicative of the overall trend. Brilliant Kinect hackers, after all, have used the unassuming little device for everything from 3D radar to Minecraft photography. Meanwhile, the Xbox has given us – drumroll – a game about baby tigers and something called "Adrenalin Misfits." Thankfully, Microsoft's official PC SDK is finally on the horizon, but this is hardly the first time console technology has been chained down by its own proprietary roots. The Wii-mote, for instance, had its own share of interesting hacks, and don't even get us started on the whole PS3 jailbreaking/homebrew fiasco. Oh no, now we don't get to spend $15 on a glorified map pack. Boo-hoo. Actually, though, this can be a make-or-break prospect depending on the game – especially if its developer leaves it high-and-dry altogether. For instance, Modern Warfare 2's online servers were quickly overrun by game-breaking cheaters, and Infinity Ward's been incredibly slow to respond ever since. Beyond that, of course, you have games like Need for Speed: Hot Pursuit and Dead Space 2, both of which have very substantial DLC packs on the way – but not for PC. Please, publishers, don't make us beg. Oh, wait. Ever since Modern Warfare 2 dropped the ball by pulling the plug on dedicated server support, every PC game developer's had to face brutal interrogation on the topic. "OK, yes, we're sure Greatest Game of All Time will be OK or whatever, but does it have dedicated servers?" Answers, however, have been mixed. Id Software's upcoming RAGE, for instance, will "probably" abandon that crucial feature in a post-apocalyptic junk pile. BioShock 2, similarly, showed its console roots by steering clear of dedicated server support as well. There is, however, a bright side here. Fan outcry over these games has caused many developers to better understand the importance of dedicated servers, leading to stronger PC multiplayer feature sets from games like Brink, Homefront, Battlefield Bad Company 2, Battlefield 3, and Medal of Honor. Fingers crossed that this trend doesn't disappear any time soon.